In 1838 three men, Messrs Edward Burgess, Henry Field and Isaac Jacobs journeyed east from Happy Valley in search of fodder for stock. After a long climb they saw a locality, which promised to provide the pastures they sought. In 1838 three men, Messrs Edward Burgess, Henry Field and Isaac Jacobs journeyed east from Happy Valley in search of fodder for stock. After a long climb they saw a locality, which promised to provide the pastures they sought. Following the ridge along which the present road runs, they chanced upon a glade covered with herbage now known as Kangaroo grass. Having cut a quantity of this, they rested under the shade of a tree to have their lunch. Isaac Jacobs and Elizabeth, his wife, were Isle of Wight people, and arrived in 1837. They resided for some time on the banks of the river Torrens, and built a small residence of reeds and ti-tree. In 1838 South Australia’s first white son was born to them, named Henry, and a son of whom is still resident in the district. 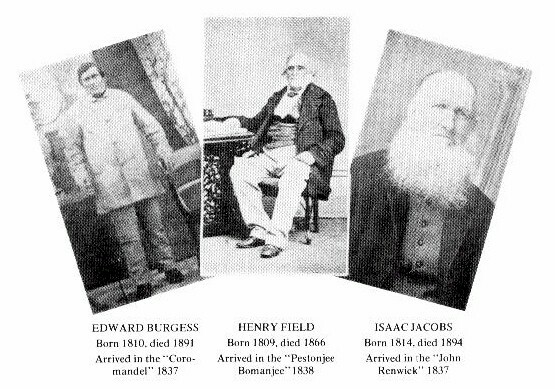 Mr Isaac Jacobs settled on a property adjoining that of Mr Field, and at the present time his two grandsons, Messrs Hal and Kenneth Jacobs, retain the holding, being the only direct descendants retaining a property of one of the founders of the district. Edward Burgess did not reside in Cherry Gardens, but later lived at Clarendon. Henry Field, formerly of Kent, England, settled on what is now known as Chapel paddock, and resided there for many years. These pioneers, after clearing their land, wrested from nature a hard won inheritance by means of wheat and potato growing. Closely following these early arrivals, and also arriving on the same ship, the Buffalo, in 1836, with Governor Hindmarsh, were Luke Broadbent and his wife, Harriet. Luke was originally a foreman in a Lancashire cotton mill, and first lived in this district on unsurveyed land now owned by Messrs Ricks Brothers, but later moved to the property now occupied by the Wunderlich Co., and worked as a clay deposit in the manufacturing of roofing tiles etc. About this time an American custodian of Immigration Supply, Mr Charles Simeon Hare, became interested in Cherry Gardens, and purchased land for speculative purposes. Mr Hare was an engineer by profession in the employ of the Government and drove the first train from Adelaide to Port Adelaide with the Governor as a passenger. In 1840 Messrs Joseph Boothey, Joseph Middleton, Mr and Mrs John White and Mr and Mrs John Chambers settled in the district. Mr and Mrs Boothey resided on Section 779, now owned by Messrs John and George Brumby and M.G.D. Basey, Mr Middleton occupying the half section now owned by J.N. Lewis. Mr and Mrs White took up their residence where Mr Hicks now lives. Mr Chambers secured the property locally known as “The Run”. This land was used for horse breeding. He found a market in India for his stock and also engaged in considerable exploration work in the Northern Territory. Mr & Mrs Joseph Lewis arrived in the colony by the ship "Fairfield", the voyage occupying 6 months. In 1846 they arrived in Cherry Gardens, purchasing their property from the aforementioned Mr Hare, paying £3 per acre. This land of the original settler is still occupied by a grandson, Mr Harry Lewis. Mr and Mrs Joseph Thompson, also early settlers, lived directly west or Mr Lewis, and during their residence here, Mr Thompson was employed by Mr Lewis, and reared a family of 7 children on £1 per week. Mr and Mrs William Brumby arriving from England, purchased from Mr Joseph Boothey half section 779, and made their residence there. A son and grandson are still in occupation. On the western boundary of Mr Lewis' property, a considerable area of land was purchased by Mr Arthur Lloyd, formerly a Church of England minister, and later his three sons settled on it and the son of Mr Benjamin Lloyd still retains a considerable area of land in the district. Mr Fairweather, arriving in the early days, took up land east of that of Mr Isaac Jacobs and planted a small area with fruit trees and vines. This family later became connected with the Education Department and are still interested in the District. The early pioneers quickly realised the need for a place of worship, and whilst they were endeavouring to erect a Chapel, religious services were held at the homestead of Mr Field. 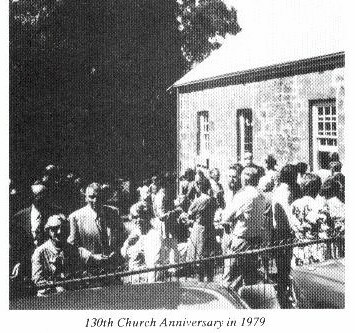 With the true pioneering spirit the Bible Christians and Wesleyan Methodists amalgamated to erect a Chapel in 1849 and that building, with additions, is still being regularly used for Divine Services, and holds the honoured record of being the oldest Methodist Chapel south of Adelaide. The land for the above mentioned building was given by Mr Field, the first Minister being the Rev. Nathaniel Bennett; and the present, the Rev. Thos. Owen. During the Ministry of the Rev. Mr Bennett the circuit extended from Willunga to Upper Sturt, and the mode of conveyance was by horseback. 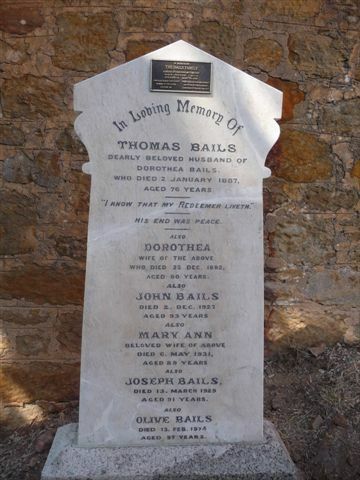 The first person to be baptised in the chapel was the late Mr Caleb Lewis in 1850, and the first marriage was solemnised between Mary Ann Lewis (sister of the above) and John Bails on the 27th June, 1862 *. 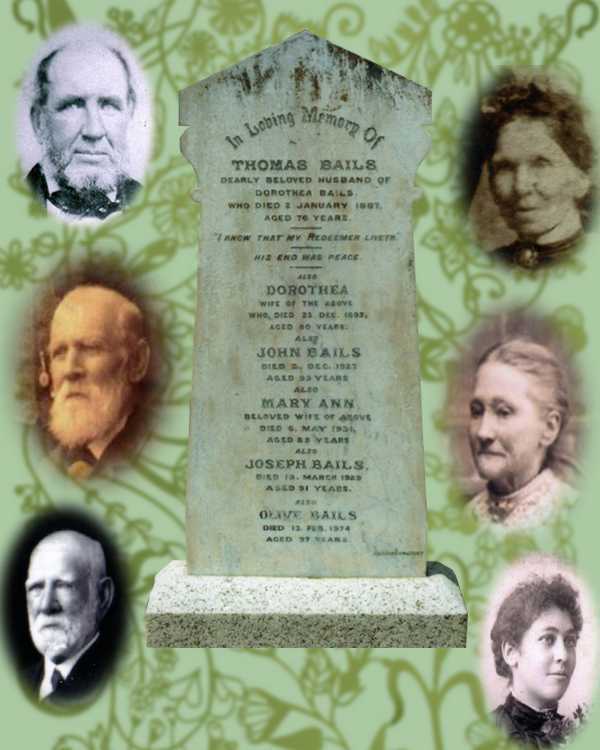 Among the earnest and faithful workers in those early days were Henry Field, Isaac Jacobs, Luke Broadbent and William Brumby, the last named and Mr I Jacobs, being Sunday School Superintendents. The zeal and fervour of the early settlers manifested itself in overflowing congregations, and it became imperative to add to the building. With their usual cheery optimism the stalwarts of the Chapel, making light of obstacles, some 40 years ago the additions were completed. Messrs Elijah and John Broadbent (sons of Luke Broadbent) laboured long and earnestly in the cause of religion, earning for themselves the names of "Sons of Thunder" by their vigorous preaching. As a result of the zealous labours of these and many others the State has benefited far and wide in a manner that cannot be measured in material possessions. In this Centenary year of the State, the descendants of those early pioneers intend to emulate their fine example by erecting a porch in keeping with the present structure. Up to the year 1882 the ground of the chapel yard constituted the local cemetery, and the last to be buried there was Isaac Jacobs in 1894, one of the founders of the district. In 1882 a new cemetery on the north-east of the settlement was opened and the first burials were Mr and Mrs Mackereth of Scott's Creek. * A correction to the above - according to the Cherry Gardens Church records, the wedding date was 27/6/1861. It was the 11th recorded wedding and the Celebrant was William Grantley Bennett. In the early days the opportunities for education were very limited, children having to walk long distances to receive instruction. A private school was conducted by a Mrs Neiman on the property now owned by John Lewis, but attendance was not compulsory. Many of the parents had a hard struggle to secure a livelihood and frequently found it necessary to keep the elder children home from school, many completing their school education at the age of 10 years. From our records, later, Mr John Ferry created quite a commotion by ceasing to teach school on January 21st, 1860, and left the school premises on 23rd January without sending in his resignation. Our next record shows :- "At a meeting convened on January 27th, 1860, the following were present:- Messrs Isaac Jacobs (Chairman), White, Field, Boothey, E. Broadbent and Fairweather. After perusal of Mr William Donnell's credentials, it was unanimously resolved to accept him as teacher at Cherry Gardens School, subject to the condition of one month's notice to be given on either side in case of removal; school fees to be 9d per week for the younger pupils and 1/6 per week for more advanced scholars, Mr Donnell opened the school on Monday January 30th, 1860." The first Government School was built on part Section 779. Its walls were of pug and roofed with straw. The floor was of wide boards with spaces between through which many utensils of school use were wont to disappear. 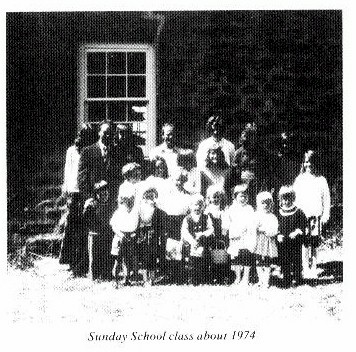 Fifty years ago the Government built a new stone school room, and later enlarged it, also a residence for the teacher, the present occupier and teacher being Mr E.R. Basham. The need of a Friendly Society was early felt, and the settlers founded the "Morning Star" Tent No. 6, Independent Order of Rechabites. The local Tent was established on March 28th, 1861, and amongst the early members were the following:- Messrs W.S. Tozer, William Nicolle, Thos. Nicolle, John, James and Edward Mildwaters, Joseph Tozer, W.J. Pennington and many others. For a number of years meetings were held in private residences, but in 1894 the Rechabite Hall, a stone building approximately 20 ft X 40 ft was erected, and in this Hall many of our Centenary celebrations have been held. To assist one another in the agricultural pursuits of the District, a branch of the Agricultural Bureau system was established on October 19th, 1892, the foundation members being Messrs Charles Ricks (President), George Brumby, Caleb and Joseph Lewis, I.S. Donnell and R.G. Hughes (Hon. Sec.). At the instance of Mr Ricks, the Hills Conference was established. Passing down the years the Bureau continues to perform its useful work. The present Hon. Sec. is Mr A.R. Stone. Towards the end of last century the Salvation Army, who had their Corps centre at Clarendon, decided to establish an outpost at Cherry Gardens. For some years private residences were used for their meetings, in 1906 the residents erected a Hall on property donated by the late Henry Jacobs, who for some years was company Sergeant Major. Under the leadership of capable and conscientious officers much good was done in the locality, one result among many others being that the honoured name of Jacobs is borne by 4 officers of the Salvation Army who are on active service in various States of the Commonwealth. The Great War of 1914-18 left its indelible mark upon the district, and of her sons who enlisted, many paid the supreme sacrifice. As a loving tribute to their memory, and through the generosity of one of our prominent residents, who gave the land for the purpose, a Soldier's Memorial Park was planted in 1923, the memory of each fallen soldier being perpetuated by a Golden Cypress tree, many other evergreen and deciduous trees forming a background of ever changing beauty. To add to its simple dignity, a Cross of Remembrance was erected in 1935. Standing as it does amongst its peaceful surroundings, it typifies the sacrifice that was so freely made, and as the years roll on, relatives and friends gather on Anzac and Violet days to pay tribute to those, and others, both men and women, by whose sacrifice Australia was born a nation. A history of Cherry Gardens would be incomplete without an effort on our part to trace its progress from the early settlement to the present day. Our forefathers constructed log fences, by felling trees into the required position where available, and by other means. This type of fence was seceded by post and rail, and that in its turn was ousted by the modern fence of the present. To market the produce from their land, they constructed rough roads, over which the bullock drays jolted and bumped. These gave place to horses, and they in their turn have been displaced by the automobile. Agricultural implements have shown drastic changes. The modern plough and harrows have been displaced by their steel brothers, the binder and mower have replaced the scythe and sickle. In the early days many of the hills were covered with wattle, whose golden bloom in the spring was a scene of beauty, and this district has been credited with having produced some of the finest quality bark, for tanning purposes, in the world. The district in its natural state was heavily timbered with various species of gum trees, also stringy bark, these fine trees afforded occupation for pit sawing in producing railway sleepers, mining timber and felloes for wheels. At the present time little remains of the timber wealth of by-gone days. Scrub has given place to pastures, thanks to the introduction of subterranean clover, and superphosphate. Cows and sheep now roam the hillsides that formerly were the home of kangaroos and emus. With the clearing of the land most of the fauna and flora have disappeared, much to our regret. The principal products of our district at the present time are milk and butter, lambs and wool, hay and peas, fruits of various kinds, including apples and pears of which in the 1936 season approximately 14,000 cases were produced. Bee keeping, vegetable growing and pigs and poultry are also among the industries engaged in. Much more could be written, but in this brief history and from records available, we have endeavoured to place before you the circumstances in which it was named and settled by our forefathers. We, their descendants, profiting by their mistakes as well as successes, render to them our heartfelt gratitude and admiration for their untiring efforts, and trust that we may not be found unworthy of the fine example they have set us. After the South Australian Centenary in 1936, the Second World War beginning in 1939 had a great influence on everyone's lives. A number of Cherry Gardens men and women enlisted to serve in the armed forces. All those at home were directly involved in Red Cross service, Home Guard training and every possible avenue was used to raise funds for the war effort. The six years of war brought a total dedication from all residents, and indeed in one of the years, Cherry Gardens received the award for having raised the most money per head of population in the state of South Australia. One of the numerous fund raising activities during the war was an annual indoors show. After the war ended in 1945, the shows were continues on, and for about 25 years became a major social event in the district. The quality of exhibits was very high in many of the classes, and received much praise from Royal Show judges and the public alike. Show day was a time for the renewal of friendships for the many visitors and relations. Soon after the war, discussion was held to find a suitable memorial to those how served in the forces. It was decided to build a new hall for the district, as the old Rechabite Hall was now in need of repair, and was really not large enough. So, with dedication and enthusiasm fund raising was channelled towards raising money for a new Memorial Hall. A piece of land on which to build the hall was donated by Mr and Mrs K.J. Edwards, being part Section 348 Hundred of Noarlunga. By 1953 sufficient funds had been raised for building to commence. Apart from a brick layer and carpenters, the hall was built by local labour, and every able bodied person contributed towards its completion. The new memorial hall was opened by the then Premier of South Australia, The Hon. 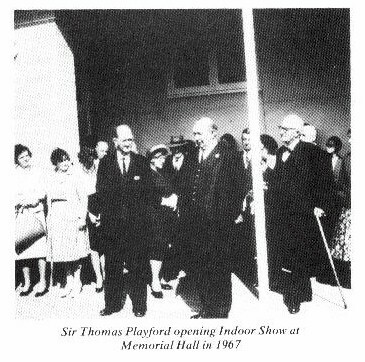 Thomas Playford (later Sir) in 1956. During the post war years, sporting activities were established to cater for the needs of the increasing number of young people living in the district. Cricket, table tennis, netball and indoor bowls teams joined their respective associations with a tennis club being formed in more recent years. Another major social event was the emergence of the Cherry Gardens Monthly Dances. These old style dances had their beginning in the Rechabite Hall under the leadership of Mr C.G. Terrell with Mr L.M. Jones playing piano. The dances became so successful during the 1960's and 70's that proceeds from these events were largely responsible for clearing the mortgage on the Memorial Hall, as well as the erection of other amenities. Part of the dance proceeds were also channelled to the local emergency fire services and sporting and social bodies. Cricket and tennis matches had been played for many years prior to World War Two on ground privately owned by Mr A.F. Lloyd. Following the sale of this land, cricket was played for a time on Mr R.H. Chapman's property on Ackland Hill Road, but the need was felt for a permanent recreation ground. In 1950 a block of land at the corner of Ackland Hill Road and Cherry Gardens Road, was obtained for this purpose and jointly owned by the people of Cherry Gardens and Iron Bank. Local labour was again used to hand clear the vegetation from the area, and an oval, tennis and netball courts have been established. The need was felt for a permanent recreation ground. 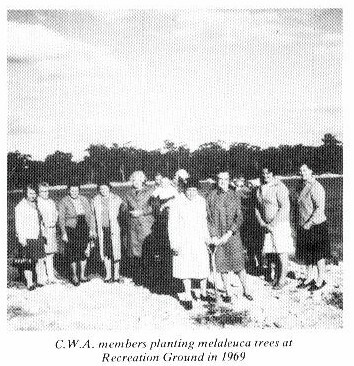 The ladies of the district formed a branch of the Country Women's Association in 1950 and many hours of fellowship have been enjoyed. The branch is still active at this time. In 1955 the electricity was connected to the district of Cherry Gardens. This was followed by the laying of E.W.S. water mains along the main roads. Just prior to this the main road was sealed, and other roads are being sealed progressively. These services dramatically lifted the standard of living from the earlier times. From the early 1860's very great change has come to Cherry Gardens. From the time when the first settlers took up land almost 150 years ago, the area had been used almost entirely for rural production. However, with the rapid expansion of the Adelaide metropolitan area, large sections of land in the district have been sold for subdivision. The population of Cherry Gardens has increased considerably, and many new homes have been, and are being built. The new houses are mainly occupied by people who have employment away from the district. At this time the number of farmers earning a living solely off the land would be less than the fingers of one hand. The Agricultural Bureau Branch continued to meet regularly until 1973, when declining membership brought about its closure. The Blackwood Golf Club sought a new course when the land on which they played was to be subdivided. This they found at Cherry Gardens where an 18 hole course has been established. Members and visitors alike enjoy playing golf amidst the pleasant surroundings which have been created. The trees, and the dams, as a source of water for the course, provide the perfect resting place for many birds and the course has been declared a sanctuary. The most recent addition to the public facilities is the new Cherry Gardens Fire Station. This was funded and erected by the Commonwealth Employment Program with assistance from the Happy Valley Council, and was opened by The Hon. Jack Wright M.P. in 1984. The district has been served faithfully and well by volunteer fire fighters since the unit was first established in 1934. However, we have lost the services of the Post Office, which was closed down in 1979. We now have a Postal Delivery Service from Blackwood, delivered by private contractor. A private bus service catering for students and workers ceased to run in 1974. The primary school was closed in 1970. The education department has provided a school bus for primary school children from that date. A Community Association has recently been formed to serve the needs of the area, and distributes a monthly newsletter to every household in the district. The Methodist Church, now the Uniting Church, which was built in 1849 continues to be used each Sunday for services and Sunday School. A Ladies Church Guild formed in 1936 has supported the church both spiritually and financially. The Methodist Church, now the Uniting Church, which was built in 1849 continues to be used each Sunday for services and Sunday School.